Gorillaz are the world's most prominent virtual band, a term used to describe a group represented by fictional characters. Behind the animated quartet's music are a team of musicians, producers, and collaborators, all led by musical mastermind Damon Albarn. Albarn started his music career in Blur, who recorded eight albums that progressed from brit-pop to electronic art rock as Albarn's musical interests expanded. Following the dissolution of Blur, Albarn formed Gorillaz with artist Jamie Hewlett. Gorillaz took a six-year break following 2010's concept album Plastic Beach and 2011's iPad-recorded The Fall, and returned to release Humanz in 2017 and The Now Now this year. Being a virtual band, much of the group's image and promotion focuses on the four animated characters that officially comprise the band, and although these guys are sometimes depicted with musical instruments, they generally don't offer much insight into the gear used on their records. Albarn's studio, called 13 Studio, is based in West London and hosts a huge array of recording gear, including a Neve VR 72 desk and a wall fully stocked with keyboards, synthesizers, and old tape delay machines. 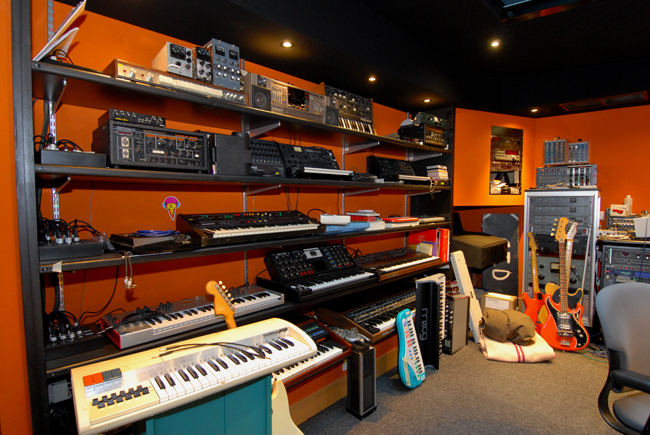 13 Studio's synth collection include several Moog synths, such as the vintage Moog Prodigy, the powerhouse Moog Voyager and the modern Moog Little Phatty. There are several vintage Korgs such as the MS-10 and MS-20, as well as a VC-10 Vocoder. Albarn also seems to like Prophets—his studio has a Sequential Circuits Prophet-5 and Prophet T8. He also used a Dave Smith Instruments Prophet-6 for the Gorillaz's 2017 tour. Additionally, Albarn makes use of two Roland Space Echos—the RE-201 and the RE-501 Chorus Echo—and it's likely that Albarn uses these for much of Gorillaz' spacier tracks. I'll dive into songs from several of the group's albums in chronological order, and recreate some of my favourite Gorillaz sounds with software synths. Gorillaz's self-titled debut album was released in 2001, and introduced listeners to Albarn's new eclectic tastes, mixing hip-hop and rock with dub-reggae and a grunge-y vibe. The first single was "Clint Eastwood," named after the actor. The song's ascending string motif was recorded using a Solina String Ensemble, a classic string machine synth used by Pink Floyd in "Shine on You Crazy Diamond" and Elton John in "Someone Saved My Life Tonight." What made the Solina special was its built-in ensemble effect, which allowed it to mimic the width of a full orchestra. The Solina offered several preset waveforms, named after instruments such as violin, viola, and trumpet, and allowed you to mix them to create a sound as thin or rich as you want. Arturia's software synth Solina V models the String Ensemble, and you can play the "Clint Eastwood" sound by choosing the violin and viola voices, turning on the ensemble effect, and raising the sustain length fader to 2000ms to get the notes to smear together. The group's sophomore album, 2005's Demon Days saw Albarn bring on Danger Mouse as a producer, and went on to be a huge hit. The album brings together indie and hip-hop, with Albarn bringing in guest rappers such as MF Doom. The album's second single, "DARE," features a stringy synth bass underpinning a bright string hook. The synth bass is a classic Moog bass patch and will have come from one of Albarn's Moogs. To set up the patch in Arturia Mini V, a software emulation of the original Minimoog, use two sawtooth waveforms tuned to 16' and detune one of these oscillators around 10% by right-clicking the oscillator knob. Turn on glide with the bottom-left switch and raise the glide knob to the 6 mark—this will create a smooth sliding effect between notes. To get the "DARE" string sound, we can again use Arturia Solina V, as its chorused sound will work perfectly. From the default patch, turn on the trumpet voice and lower the sustain length to the 500ms to 600ms range. 2010's Plastic Beach saw Albarn going all-out, exploring a full-fledged concept album and using synthesizers more than previous albums. One of the highlights of the album is the second half of "Empire Ants," where the track switches gears from a Pink Floyd-esque piano ballad into a synth freakout featuring guest vocals and instrumentation by Little Dragon. The bonus documentary The Making of Plastic Beach shows a Moog Voyager and a Rhodes Chroma being used to record tracks for the song. The Chroma is a rare analog synthesizer from the early '80s and was incredibly advanced for its time, being one of the first synths to be able to interface with a computer. The lead part is comprised of two tracks, with the descending arpeggio track panned slightly to the right. You can use Mini V to create similar tracks, using detuned sawtooth waves all tuned to 8', and leaving the filter and envelopes wide open. Process the track with plenty of delay and reverb—I used Soundtoys EchoBoy with the Space Echo style to emulate Albarn's Roland Space Echo units. The bass patch is a short, snappy Moog bass, similar to the one used in Frank Ocean's "Pyramids." Use three sawtooth oscillators tuned to 32', 16', and 8', with the 32' oscillator set to a low volume. Bring the filter down halfway and set a filter envelope with a very short decay and no sustain to add some attack to the sound. Make sure there is no release on the patch, as you want to play very short notes, with plenty of space between them. The icing on the cake is the synth strings, which sounds like the Solina String Ensemble doing what it does best. I loaded up the patch "Diamond Strings," which is one of the lushest sounding string machine patches you'll find. For the synth choir in the verse I used Arturia Prophet V in its VS mode, using a choir wavetable to build the patch. Production-wise this track is incredibly saturated, so reach for your favourite saturation plugins to get this vibe! I dropped Soundtoys Decapitator on every track at a low drive setting to get some crunch into the mix. The album's title track features electronic arpeggios over a dirty-sounding synth bass. For the arpeggio patch use Mini V's saw-triangular waves to get the lo-fi, mellow sound, and either use the synth's built-in arpeggiator or program notes on a piano roll to create the rolling arpeggio effects. The bass patch is a dirty Moog patch, maybe the Moog Prodigy. The Prodigy is an entry-level Moog from 1979, and has since become a widely used bass synth for electronic music and techno. Use detuned sawtooth waveforms and set the filter emphasis nice and high to get the envelope sounding wet. To get the patch nice and dirty, use Mini V's External Input Volume knob to feed some of the signal back into the input, and a saturator plugin to process the track I opted for Ableton Live's Saturator effect. "Glitter Freeze" has a nautical theme: morse code spells out Plastic Beach, and then we're treated to a synth jam that starts with a morse code style riff. The lead synth is quite lo-fi, and likely came from an inexpensive toy keyboard. It can be recreated in Mini V by using a single square wave oscillator, specifically the narrow-rectangular waveform with the width pulled all the way to 0. To adjust the oscillator width in Mini V, right click the oscillator knob and adjust it to set custom pulse-widths. The bass track is a smooth-sounding patch that may have come from Albarn's Moog Phatty. You want to dial in a patch with a smooth, squelchy character, so avoid detuned oscillators or overdriven/saturation effects here. Set up a single sawtooth oscillator and raise the filter emphasis to the 4 mark. You can optionally add in a triangle oscillator to add some sub to the bass patch. "On Melancholy Hill" was the third single released from Plastic Beach, and draws from synthpop and new-wave to create a nostalgic vibe. The main keys employs layers of filtering and phasing effects. A bright, retro sounding lead acts as one of the main hooks. To program the lead sound in Solina V, use the viola, violin and humana voices with the ensemble effect on and switched to stereo. Set the sustain length to almost minimum and run the track through some delay to get a wet sound. I used EchoBoy again, and also low-passed the track at about 600Hz to filter out some low-end frequencies and make the track brighter. The main organ in "Broken" is from a transistor-style electric organ. Arturia Farfisa V provides some killer electric organ sounds, and nails the "Broken" sound. The lead synth is simple, and requires only a triangle waveform and a pitch-bend wheel. Set the patch up so the envelopes and filters are wide open and the pitch-bend wheel is set to bend two semitones. Think like a slide guitar player and use the pitch-bend wheel to dip the pitch at the end of long notes. I used Arturia Prophet V because its clean sound worked well to create a mellow vibe. Following a six year break, Gorillaz released Humanz, which featured a huge list of collaborators and saw Gorillaz approach dance music territory with the single "Andromeda." The song has a definite "Billie Jean" influence. Opening with a robotic drum beat and funky bassline, the song then crescendos into a huge chorused synth lead. The track was probably recorded with modern synths and gear, but can still be programmed in Mini V.
You want it to sound as big and bright as possible, so use three wide rectangular wave oscillators tuned to 16', 8', and 4'. Adjust the oscillator volumes in the mixer so the higher-pitched oscillators are a louder volume. Leave the cutoff all the way open and set the amplifier envelope with the decay knob at the 600 mark and sustain all the way down. Add some chorus and delay to the patch—the onboard FX in Mini V work great for this. Gorillaz dropped their latest album, The Now Now in June 2018, and it sees Albarn working with fewer contributors than previous albums. Album opener "Humility" is a vintage-sounding track featuring George Benson's guitar licks over a funky synth beat. The main patch in "Humility" sounds like it could've come from one of Albarn's Prophet synths, and can easily be set up in Prophet V using detuned sawtooth waves and a quick envelope. To set up the envelope, lower the cutoff frequency all the way, raise resonance to the 10 o'clock mark and envelope amount to the 3 o'clock mark, then set the ADSR filter envelope with the decay at 2 o'clock and sustain at 11 o'clock. Add some of Prophet V's onboard chorus and compress it with a nice compressor to get the track sounding punchy—Ableton Live's Glue Compressor or the PSP oldTimer will work great. Lake Zurich is a cinematic synth jam featuring layers of funky synthesizers and percussion. It starts with a simple Moog pluck pattern that modulates the filter with a very short filter envelope. For the string patch I again turned to Arturia Solina V, but with some under-the-hood adjustments to boost the brightness. Click the back of the interface to open the extended panel, and here you can open the cutoff and boost the resonance of the resonators—do this to the filter on the right to increase the brightness. About the Author: Dan Carr runs Reverb Machine, a website dedicated to exploring "the wonders of synthesizers and music production." Check out his site for more breakdowns of popular artists' use of synths and unique recording techniques. 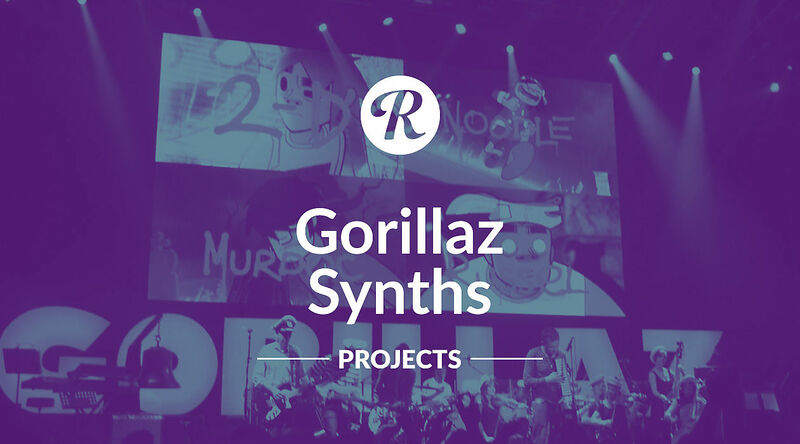 Above, you can download the Arturia software synth patches used to recreate Gorillaz's tones—and the Ableton Live sessions for each track.